Martha Friendly, Gordon Cleveland and Tricia Willis. Families sometimes have needs for child care which are not easily met by ordinary child care services. When a child is ill, when the usual caregiver is unable to provide care, or when other short-term child care emergencies arise, many families are unable to find care. Similarly, shiftworkers often find it difficult to make suitable arrangements for care for their children. Farmers and other rural workers often find it impossible to arrange reliable, convenient child care to meet their needs. 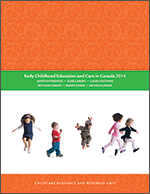 This report examines policy and program options to meet these atypical child care needs. It is intended to provide an overview of current services and policies, program models and issues for those with an interest in service delivery and policy development. Originally printed 1989; reprinted 1994. Out of print: available for download only.